March 15, 2012 | David S. Maldow, Esq. Today, Avaya announced that it is in the process of acquiring Radvision, a leading provider of videoconferencing and telepresence technology. Telepresence Options was privy to an analyst only briefing this morning where we received the inside scoop from Radvision CEO, Boaz Raviv and Avaya senior vice president & general manager for Collaboration Infrastructure, Gary Barnett. This combination is a particularly good fit as Avaya and Radvision have complementary technologies. Adding Radvision's cutting edge videoconferencing technology to Avaya's existing Aura Conferencing platform should result in an extremely competitive UC and videoconferencing portfolio including the back-end video infrastructure required for enterprise customers and service providers. Radvision has a history of creating great products but struggling in the market due to other factors. For example, when Tandberg purchased Codian in 2007, Radvision found itself to be the last major independent MCU manufacturer. Radvision's MCU at the time was competitive based on capabilities and price, but it was competing against multiple vendors offering complete MCU and endpoint packages. Radvision weathered this storm partially via a partnership with Cisco, which used Radvision technology for many of its video offerings at the time. Of course, this partnership was clearly doomed by Cisco's purchase of Tandberg in 2009. In 2010, Radvision purchased Aethra, gaining the intellectual property and technology required to finally develop proprietary endpoints. These new endpoints, as well as continued developments on their MCU, proved to be impressive. Unfortunately, it was still an uphill battle selling against competition which had long been offering complete solutions through well established channels. During my time at the Wainhouse Research test lab, I had plenty of opportunities to work with Radvision equipment over the years. I was always amazed at how Radvision's performance in the test lab far exceeded their performance in the marketplace. You may be thinking that Avaya already has video solutions, so why do they need Radvision? Avaya's main focus has been on desktop videoconferencing. For room solutions and infrastructure they sell rebranded products from other vendors or rely on partnerships to satisfy their existing customer needs. Avaya would much prefer to offer their 4000+ existing customers a single, unified communications solution that works on the desktop, room systems, and mobile devices while being supported by a single user interface. Nick Francis (Avaya: VP Sales, Video Collaboration) says that Avaya's, "customers are looking for a total solution in unified communications and looking for it to be delivered by the leader in UC." This acquisition is designed to meet that goal. 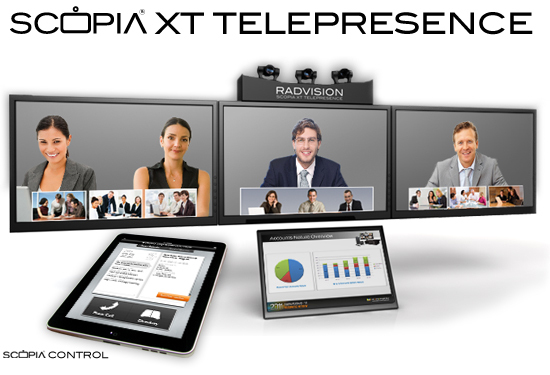 One example of what Avaya will be getting is Radvision's videoconferencing endpoint, the new SCOPIA XT5000. This new endpoint immediately created a lot of buzz in the industry about its impressive specs. The endpoint supports 1080p/60fps video, H.264 High Profile, H.264 SVC, embedded 9 way multipoint and more. This product is a perfect example of the historic Radvision problem. They have a cutting edge endpoint, arguably industry leading on specs, and an uphill battle sell it against competing endpoints from vendors with better sales channels. This endpoint deserves to be part of something bigger, like Avaya's Aura platform where it can be integrated into a end-to-end solution including desktop, directory, and presence functionality. 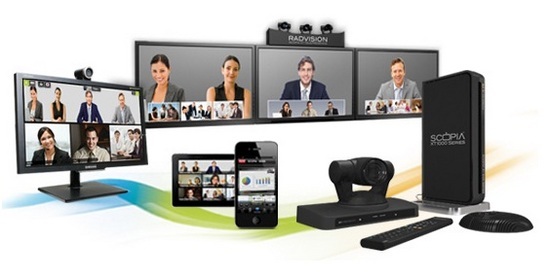 Radvision's endpoint lineup also includes a number of similar room systems, desktop and mobile clients, and a three-screen modular group telepresence platform. Avaya will also be getting Radvision's infrastructure technology. The SCOPIA MCU is another Radvision product which never really got the recognition it deserved. For example, many vendors today are pushing hard to integrate their video solutions with Microsoft Lync. I used the SCOPIA to make video calls from Lync back when it was still called OCS! Hopefully, Avaya will be able to leverage its channel and customer base to finally give Radvision technology the appreciate it deserves. Please note that Radvision's infrastructure portfolio goes beyond their flagship SCOPIA MCU and includes gateways, firewall traversal and related products. During this morning's briefing, Avaya made it clear that their Flare Experience will be the common interface for all of their UC offerings. Avaya understands the value of providing their customers with a common look and feel for all their communication services and devices. Communication technology can be intimidating enough, you don't want to force customers to learn to use one UI in the boardroom and another at the desktop and yet another on their mobile device. On the one hand, it may seem unfortunate that Radvision's user interfaces will be phased out. Radvision clearly put a lot of development cycles into their UI and the result is a particularly user friendly design. However, after taking a look at Flare, the choice is clear. Flare may be the sexiest UC interface on the planet (see the video below). The Flare experience, with video powered by Radvision technology, will be an extremely compelling solution. As described in this month's Telepresence Options Telegraph by publisher, Howard Lichtman, there is more to the story. Avaya is currently owned by Silver Lake and TPG Capital. Silver Lake also owns AVI-SPL, which happens to be the largest videoconferencing and telepresence integrator in the world. AVI-SPL recently purchased Iformata, giving them their own VNOC and VC exchange so they can offer full-fledged VC managed services. Silver Lake also owns Sabre which is now providing reservation services for 1200+ Regis public telepresence rooms. With Avaya buying Radvision, we wind up with an incredible set of communication products, services, and support all in the Silver Lake family. What makes all of this particularly interesting is the fact that Charlie Giancarlo, the man behind telepresence at Cisco, is a partner at Silver Lake and the chairman at Avaya. As a result, we suspect this acquisition may be the beginning of some very exciting developments from Avaya. You may be thinking that Avaya already has video solutions, so why do they need Radvision? Avaya's main focus has been on desktop videoconferencing. For room solutions and infrastructure they sell rebranded products from other vendors or rely on partnerships to satisfy their existing customer needs. Avaya would much prefer to offer their 4000+ existing customers a single, unified communications solution that works on the desktop, room systems, and mobile devices while being supported by a single user interface. Nick Francis (Avaya: VP Sales, Video Collaboration) says that Avaya's, \"customers are looking for a total solution in unified communications and looking for it to be delivered by the leader in UC.\" This acquisition is designed to meet that goal.